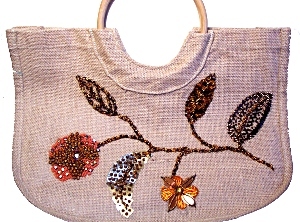 A brown handbag decorated with flower and leaf motif bead embroidery. The decoration uses back stitch, satin stitch, bead stacks amongst others, and uses a variety of beads and sequins. I began this bag as part of an bead embroidery/ tambour beading workshop I went on at The London College of Fashion.